Duo Country US originaire de Henegar (Alabama), Ira Lonnie Loudermilk né le 21 Avril 1924 et Charlie Elzer Loudermilk né le 7 Juillet 1927, les Louvin Brothers ont débuté en 1943 dans un show radio. Premier enregistrement à la fin des années quarante pour Decca Records. Puis ils passent chez MGM en 1951, mais c'est chez Capitol en 1952 qu'ils connaîtront le succès. Ira et Charlie furent un duo régulier au Grand Ole Opry (WSM, Nashville, Tennessee). Ils se sont séparés en 1963. Ira est mort accidentellement le 20 Juin 1965 et Charlie le 26 Janvier 2011. 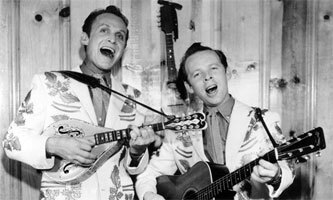 From the close-harmony brother acts of the '30s evolved Charlie and Ira Louvin, ranking among the top duos in country music history. With Ira's incredibly high, pure tenor and Charlie's emotional and smooth melody tenor, they learned well from the Bolick brothers (the Blue Sky Boys), the Monroe Brothers, the Delmore Brothers, and other major family duos of the previous generation, preserving the old-time flavor while bringing this genre into the '50s, when country music moved to a newer sound. 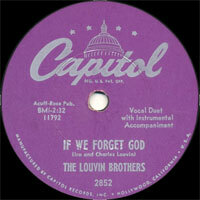 Whatever type of songs they recorded -- gospel, folk, hillbilly, or '50s pop -- those songs became the Louvins'. Add to the list the many Louvin compositions (for example, "If I Could Only Win Your Love," Emmylou Harris' first hit), and you have an act that is outstanding in country music history. Their career took awhile to get going, partly because of interruptions from WWII and the Korean War. In the early '50s, after making a reputation for unexcelled gospel singing, the Louvins broadened their repertoire, recording "The Get Acquainted Waltz" (with Chet Atkins adding another guitar to Charlie's and to Ira's mandolin), a fair hit that showed success was reachable with non-religious music. The electric guitar, with the duo's unique harmony and Ira's exceptional tenor, created a sound that fans asked for in increasing numbers. In 1955, after ten unsuccessful auditions, they finally joined the Opry, where they performed to great acclaim until 1963, when they broke up. They had a number of hits, including the much-covered "When I Stop Dreaming" and "Cash on the Barrel Head." Following the duo's breakup, Ira and Charlie both pursued solo careers. Born and raised in the Appalachian mountains in Alabama, both Charlie (born Charlie Elzer Loudermilk, July 7, 1927; died January 26, 2011) and Ira (born Lonnie Ira Loudermilk, April 21, 1924; died June 20, 1965) were attracted to the close-harmony country brother duets of the Blue Sky Boys, the Delmore Brothers, the Callahan Brothers, and the Monroe Brothers when they reached their adolescence. Previously, they had sung gospel songs in church, and their parents encouraged them to play music, despite the family's poverty. Ira began playing mandolin while Charlie picked up the guitar, and the two began harmonizing. After a while, they began performing at a small, local radio station in Chattanooga, where they frequently played on an early-morning show. The Brothers' career was interrupted in the early '40s when Charlie joined the Army for a short while. While his brother was in the service, Ira played with Charlie Monroe. Once Charlie returned from the Army, the duo moved to Knoxville, TN, where they received a regular spot on a WROL radio show; they later moved to WNOX. 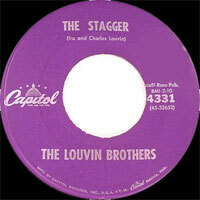 Around this time, they decided to abandon their given name for Louvin, which appeared to be a better stage name. (Their cousin John D. Loudermilk retained the family name.) Following their stint in Knoxville, they moved to Memphis, where they broadcast on WMPS and cut one single for Apollo Records. After their brief stay in Memphis, they returned to Knoxville. 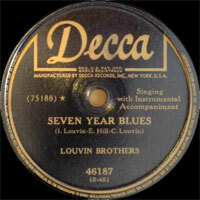 In 1949, the Louvin Brothers recorded a single for Decca Records which failed to make much of an impact. Two years later, they signed with MGM Records and over the next year recorded 12 songs. Shortly after their MGM sessions were finished, Charlie and Ira moved back to Memphis, where they worked as postal clerks while playing concerts and radio shows at night. Eventually, they earned the attention of Acuff-Rose, who signed the duo to a publishing contract. Fred Rose, the owner of the publishing house, helped the duo sign a contract with Capitol Records. 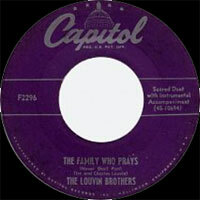 the Louvins' debut single for the label, "The Family Who Prays," was a moderate success (it would later become a gospel standard), yet they were unable to capitalize on its success because Charlie was recalled by the Army to serve in the Korean War. Upon Charlie's discharge from the Army, the Louvins relocated to Birmingham, where they planned to restart their career through appearances on the radio station WOVK. However, a duo called Rebe & Rabe had already carved out a close-harmony niche in the area, using several of the Louvins' own songs. When Charlie and Ira were reaching a point of desperation, Capitol's Ken Nelson was able to convince the Grand Ole Opry to hire the duo. Prior to joining the Opry, the duo had been marketed as a gospel artist, but they began singing secular material as soon as they landed a slot on the show, primarily because a tobacco company sponsoring its broadcast told the Opry and the Louvins "you can't sell tobacco with gospel music." While they didn't abandon gospel, The Brothers began writing and performing secular material again, starting with "When I Stop Dreaming." The single became a Top Ten hit upon its release in the fall of 1955 and would eventually become a country standard. It was followed shortly afterward by "I Don't Believe You've Met My Baby," which spent two weeks at number one early in 1956. No less than three of the duo's other singles -- "Hoping That You're Hoping," "You're Running Wild," "Cash on the Barrel Head" -- reached the Top Ten that year, and they also released the albums Tragic Songs of Life and Nearer My God to Thee. 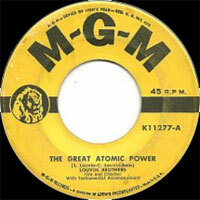 the Louvins' success in 1956 was particularly impressive when considering that rock & roll was breaking big that year, sapping the sales of many established country artists. 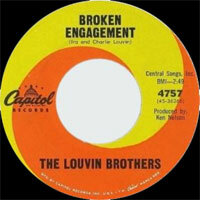 However, the Louvins weren't able to escape being hurt by rock & roll. They had two relatively big hits in 1957 ("Don't Laugh" and "Plenty of Everything but You"), "My Baby's Gone" reached the Top Ten in late 1958, and their classic version of the traditional ballad "Knoxville Girl" was a moderate hit in early 1959, but those four hit singles arrived in the space of three years; they charted four songs in 1956 alone. Soon, the Louvins were receiving pressure from Capitol to update their sound. They tried to cut a couple of rockabilly numbers, but they were quite unsuccessful. Eventually, Ken Nelson suggested that the duo abandon the mandolin in order to appeal to the same audience as the Everly Brothers. the Louvins didn't accept his advice, but the remark did considerable damage to Ira's ego and he began to sink into alcoholism. the Louvin Brothers continued to record during the early '60s, turning out a number of theme albums -- including tributes to the Delmore Brothers and Roy Acuff, as well as gospel records like Satan Is Real -- as well as singles. "I Love You Best of All" and "How's the World Treating You" reached numbers 12 and 26 respectively in 1961, the first year they had two hit singles since 1957. However, the duo began fighting frequently, and Ira's alcoholism worsened. Following one last hit single, "Must You Throw Dirt in My Face," in the fall of 1962, the duo decided to disband in the summer of 1963. Charlie and Ira both launched solo careers on Capitol Records shortly after the breakup. Charlie was the more successful of the two, with his debut single, "I Don't Love You Anymore," reaching number four upon its summer release in 1964. For the next decade, he racked up a total of 30 hit singles, though most of the records didn't make the Top 40. Ira's luck wasn't as good as his brother's. Shortly after the Louvins disbanded, he had a raging, alcohol-fueled argument with his third wife, Faye, that resulted in a shooting that nearly killed him. He continued to perform afterward, singing with his fourth wife, Anne Young. The duo were performing a week of concerts in Kansas City in June of 1965 when they were both killed in a car crash in Williamsburg, MO. After his death, his single "Yodel, Sweet Molly" became a moderate hit. The Louvin Brothers' reputation continued to grow in the decades following their breakup, as their harmonies and hard-driving take on traditional country provided the blueprint for many generations of country and rock musicians. The Everly Brothers were clearly influenced by the duo, while country-rock pioneer Gram Parsons drew heavily from the Louvins' deep catalog of classic songs, recording "The Christian Life" with the Byrds and "Cash on the Barrelhead" as a solo artist. 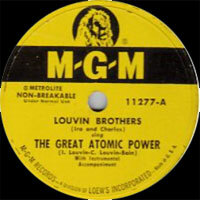 the Louvin Brothers and their music are truly legendary. The Family Who Prays - Part 3 - ? / ? / ? / ? 1993 CD CAPITOL 077778927129 (UK) Capitol Country Music Classics - Broadminded / The Family Who Prays (Shall Never Part) / When I Stop Dreaming / Alabama / I Don't Believe You've Met My Baby / Hoping That You're Hoping / Kentucky / Katie Dear / Knoxville Girl / Don't Laugh / You're Running Wild / Cash On The Barrel Head / Plenty Of Everything But You / This Little Light Of Mine / Tennessee Waltz / Are You Teasing Me? / My Baby's Gone / If I Could Only Win Your Love / Satan Is Real / The Christian Life / Blues Stay Away From Me / I Love You Best Of All / How's The World Treating You? / The Great Atomic Power / Must You Throw Dirt In My Face / Stuck Up Blues / Thank God For My Christian Home / What Would You Give In Exchange For My Soul?